Since there’s really not that much opera in my area, I’ve decided to review radio broadcasts and the Met Live in HD performances as well. I listened to the web broadcast of Britten’s Billy Budd, which is I believe the last run at the Met this season. It’s not an opera that I’m very familiar with, but this (and Makropoulos, which I will be listening to and review later today) is a welcome relief from all of the Traviatas and Bohemes everywhere. Overall it was a strong performance, but I can’t help thinking that this particular cast would have been ideal a) 5-10 years ago and b) in a smaller house. 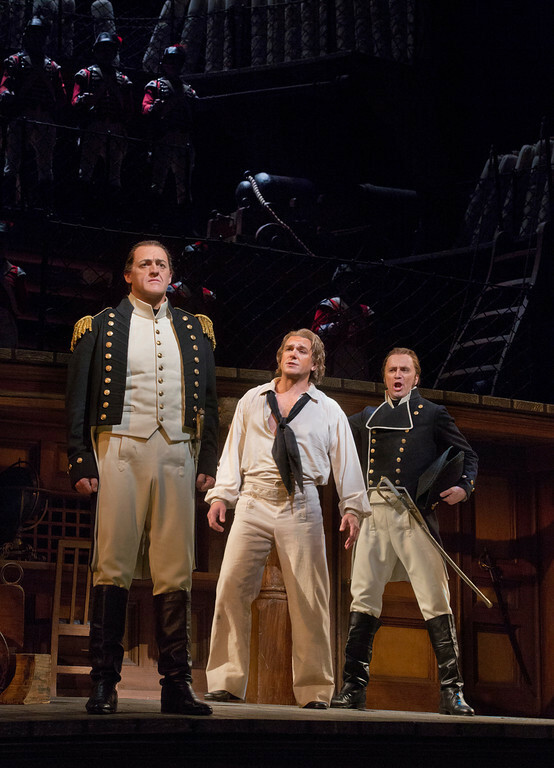 Billy Budd is one of Nathan Gunn’s most famous roles, and his experience in the role shows. He managed to convey Billy’s rough, lower-class background while maintaining the purity and innocence differentiates him from the rest of the sailors. Gunn’s phrasing was excellent, and his big aria in Act II was sensitive and moving. However, Gunn’s voice is not a big voice, and even on the radio, he sounded overwhelmed at times. In addition, his voice has lost the freshness that it had on his 2005 recording of the role, and the whole time I thought that it was a bit late for him. It was also too late for James Morris as Claggart, who sang the role in the Met premiere in 1978. Morris is still an intelligent and musical singer, but his voice is obviously not as fresh as it was 30 years ago. In addition, I found his portrayal of Claggart to be a little bit too one-dimensional – there was a lot of growling and barking (which may have been a result of his vocal state). Still, he was still an effective, menacing Claggart. The third principal of the opera is Captain Vere, sung in this performance by John Daszak. I found him a lovely singer, with a beautiful voice and excellent diction. However, he tended to push a little in heavier sections, and as a result, his intonation was slightly off at times. He phrased the music intelligently, but I did not hear the real emotional conflict that the character requires. I hope that he will develop further into this role though, as he sang beautifully in the softer sections. The rest of the cast was excellent and luxuriously cast, especially the wonderful Kyle Ketelsen as Mr. Flint. Ryan McKinny made his debut as Mr. Ratcliffe and was both vocally and dramatically excellent. Dwayne Croft was also very good as Mr. Redburn, but again would have been better about 10 years earlier. Elliot Madore as the Novice’s Friend sang well and will certainly make a good Billy Budd in the future, but like Gunn had a tendency to push his voice. The chorus was excellent – every section was very tight, phrased well, and was very clear. The orchestra was also very good, although there were some issues in the brass and a few ensemble issues. Other than that, conductor David Robertson gave an exciting and clear interpretation of the piece.